Talk of a review into the performance of head coach Anthony Griffin is being blown way out of proportion. The club held a review into its on-field operations during the representative round two weeks ago, which is not unusual. I’m told things got fiery at various times during the process but Anthony Griffin was well involved in the reviews and the plans moving forward. There is no new review into Griffin. On Channel Nine’s ‘100% Footy’ on Monday night, Panthers boss Phil Gould denied he and Griffin have fallen out and confirmed Griffin was under contract until the end of 2020. Whatever respect Daily Telegraph journalist Phil Rothfield had left within the Panthers organisation is quickly diminishing. ‘Buzz’ played a significant role in the Griffin story being re-ignited on Monday, but it seems his entire piece was based around Griffin not returning a phone call and text message. He then bizarrely tossed Des Hasler’s name around as a possible replacement – a story so far off the mark it isn’t funny. But the strangest claim of all? Buzz mentioned the possibility that Griffin was being ‘gagged’. Hard to believe when you consider he fronted open press conferences on both Friday and Saturday, where no question was off limits. Rothfield chose to attend neither. Scoop confirmed: I told you way back in March that the Panthers were looking to re-sign Reagan Campbell-Gillard on a long-term deal. The big fella secured his future with an epic six-year contract last week. Youngster Caleb Aekins has signed a new two-year deal with the Panthers. The contract extension means the 20-year-old outside back will remain with Penrith until at least the end of the 2020 season. 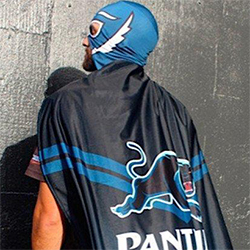 Originally hailing from New Zealand, Aekins starred for the Panthers’ NYC side in 2016 and 2017 before making the step up to the Intrust Super Premiership NSW this season. Prop Kaide Ellis has also signed a new deal with the Panthers. The 21-year-old was off-contract at the end of the season but has signed on for the next two years. 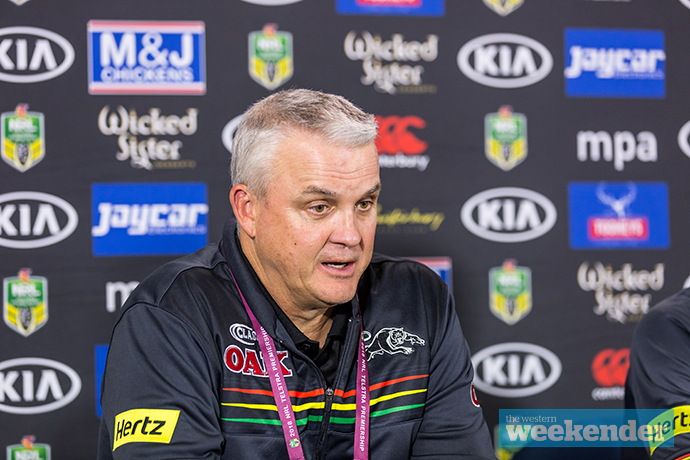 “I didn’t think twice when the opportunity came to re-sign with Panthers,” Ellis said. The baby boom continues at the Panthers with James Tamou and his wife Britt welcoming their fourth child, a son, late last week. Meanwhile, Tamou’s nappy buying budget has taken a hit after he was fined $1,100 for ‘Contrary Conduct’ on Manly’s Dylan Walker during last Saturday afternoon’s match at Panthers Stadium. 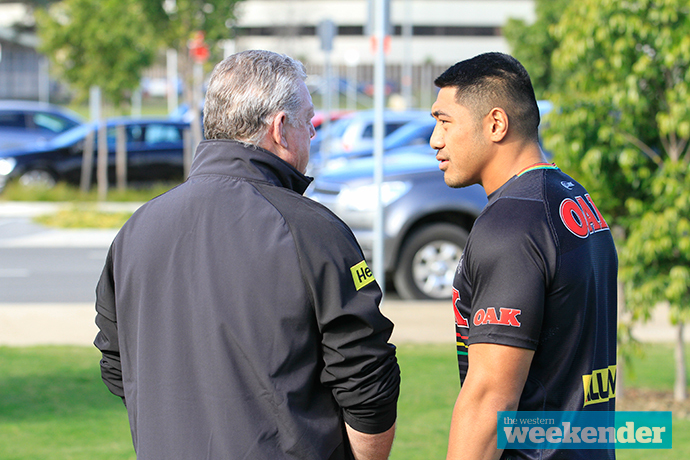 Inspiring words: We captured this pic of Phil Gould having a word with forward Moses Leota on Tuesday afternoon. Gus was very present at the club’s media session on Tuesday, even playing the role of media intern and joining in on an interview between two journalists and Trent Merrin. The football may not have been all that entertaining last Saturday afternoon but I’m told there was plenty of action in the Panthers Stadium media box. The whisper is that a newspaper journalist and a member of Manly’s media team almost came to blows, carrying on a feud that started at the back end of last year. As expected, Panthers trio James Maloney, Nathan Cleary and Tyrone Peachey will all play for the Blues in the third and final Origin match at Suncorp Stadium. Meanwhile, Penrith youngsters Brian Too and William Burns have been selected in the NSW Under 20’s side. Spotted: Panthers legend Mark Geyer and his family hitting a few balls at Aqua Golf last weekend.